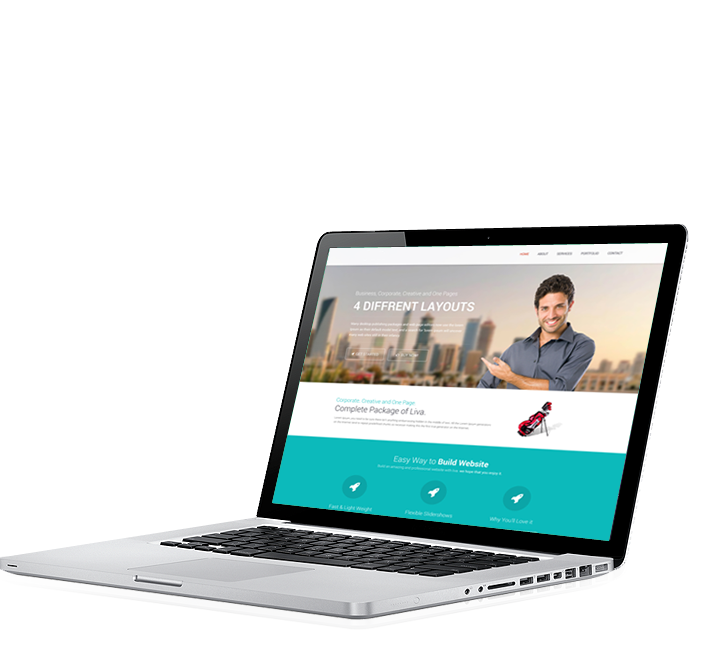 Build an amazing and professional website with us. we hope that you enjoy it. Our website designs are aesthetic and enough appealing to help you convert traffic to your website to customers. 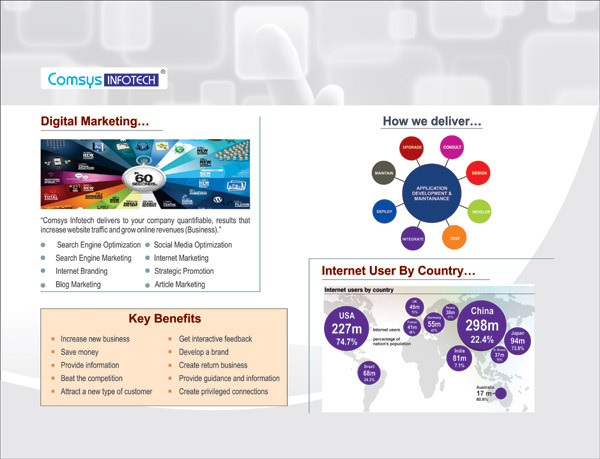 The technology we use in Web desining is the latest and the best. We make use of various latest technologies to deliver our web development services. We follow the standard methodology for web development and test it thoroughly before the delivery. 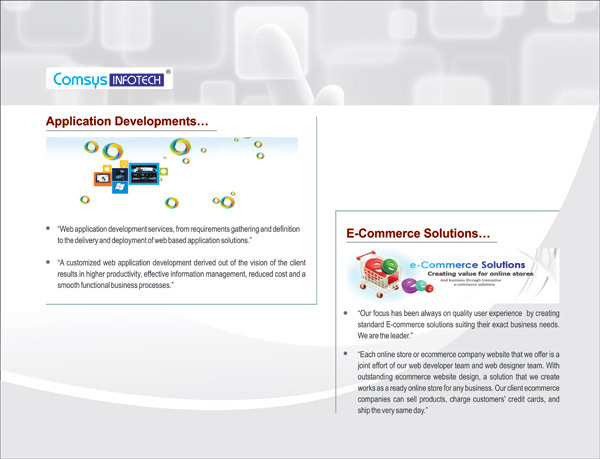 and deployment of web based application solutions. 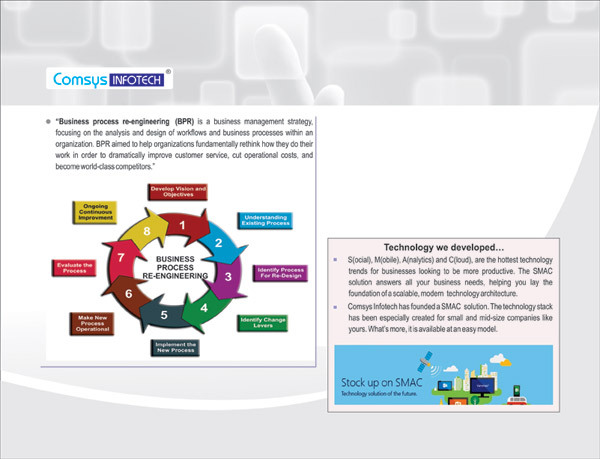 by creating standard E-commerce solutions suiting their exact business needs. We are not like this because we work here. We are here because we are like this. Being good isn't good enough. Being better doesn't cut it either. We strive for excellence. 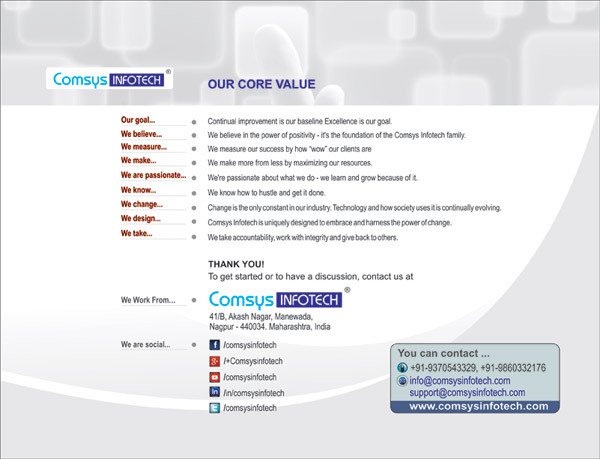 For Comsys Infotech, our challenge is to consistently do better in our unending quest for excellence. We compete intensely. Yet, we also celebrate our wins. When we achieve the results we want, we take note. This type of winning culture the kind that learns from the wins — is the drive behind our many successes. And the platform that supports it is the environment we have worked hard to create. We encourage creativity and innovation, igniting a passion for progress and cultivating a sense of purpose. Relentless Excellence: In Everything We Do No matter the task we're working on, we always ask ourselves "Is this the best it can be?" With this question underlying everything we do, we're able to create hard-hitting Internet marketing campaigns that capture more leads, and we design ecommerce stores that turn more visitors into customers. It all adds up to helping our clients flourish online. We're always trying to do it better, no matter how ordinary the task may seem. The end result? We exceed expectations on all fronts even with those every-day, low-expectation tasks. 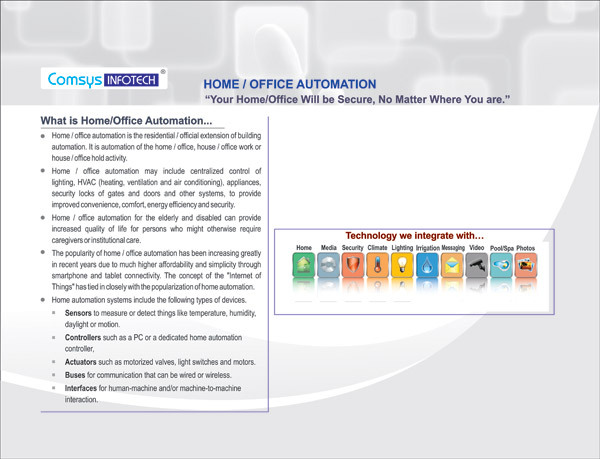 It's the unique Comsys Infotech signature we add to everything we do. Everything we touch, we want to leave better. Our strive for excellence is relentless. We don't give up as we've seen our persistence pay off time and time again. While we might change our angle, we never lose sight of the goal. It's this dedication that's behind our ongoing quest for the best. And it's this dedication that results in long-term working partnerships with our clients. Continual Improvement: Always Getting More from the Web By working within the concept of "there's always room for improvement," we continue to push ourselves, the limits and the possibilities. We're always finding new ways to improve because we sweat the details. Being concerned about the little things translates to finding big ways to improve. When it comes to our market those companies with a strong focus on web revenues we're not just looking to be the best Internet marketing company we want to be the best long-term provider of the internet services that get them exactly what they need: more from the web. 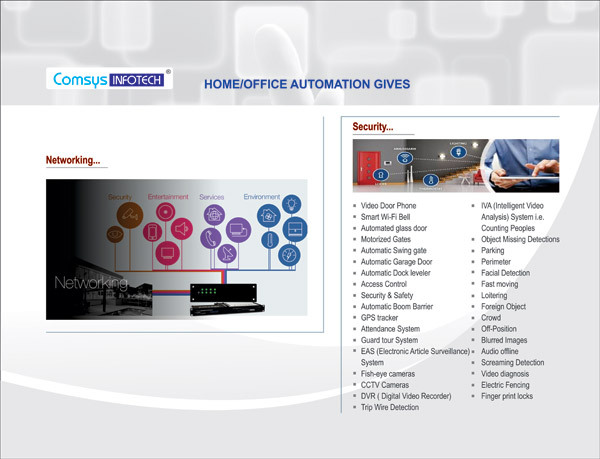 While our goal is to be a great company, we also want to be the best company to work for in India. We contribute this honor directly to our unique blend of work and fun wrapped up in a positive, nurturing environment. While we may be intensely competitive, we're just as compassionate. While "fun," "humor" and "happiness" describe our work life, "warm and friendly" describes our environment. We make sure each team member feels valued, appreciated and supported. And we strive to approach each task and challenge in a positive and optimistic way. 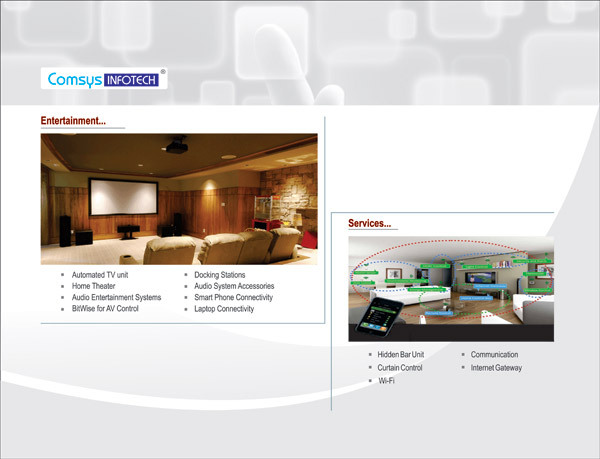 Complaining has no place at Comsys Infotech! 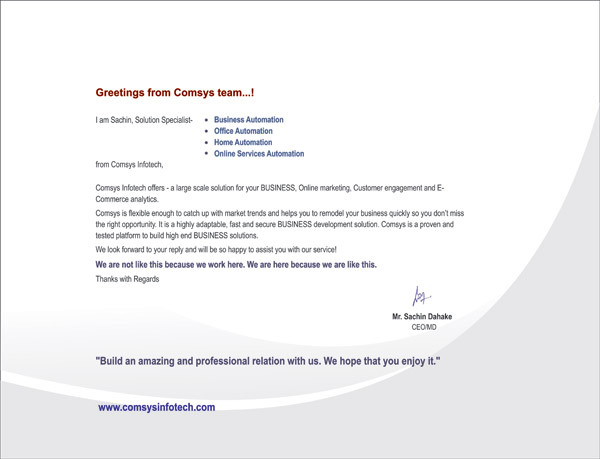 When one becomes a Comsys Infotech employee, they also become a mentor. Each member of our team brings a unique set of talents, interests and abilities. By being a positive influence on one another, we grow as a team. As a whole, we strive to create harmony. This means absolutely no gossip, cynicism or negative interactions not only pointless, this negativity is also detrimental. We speak positively and supportively about team members when apart because it's how we truly feel. We never condemn or criticize and this policy extends to our vendors and clients. Just as important is how we handle the errors made by others. We don't point out the mistakes in a negative way; instead, we let the other person save face. 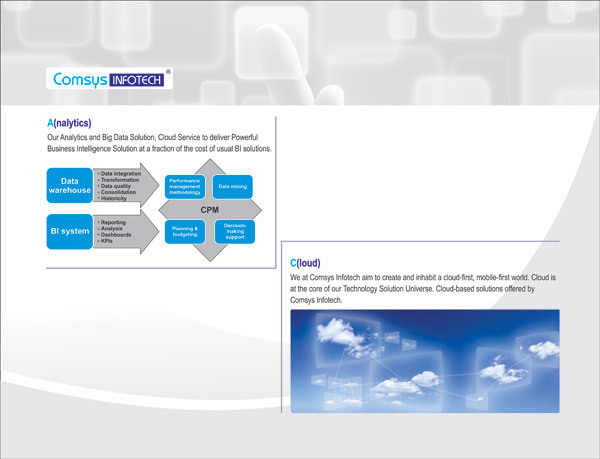 By focusing on the positive, we contribute to the winning spirit behind Comsys Infotech. This means making a consistent effort to give genuine appreciation. Another key component to our positive working environment is effective communication. Every team member understands his role and the steps he needs to take in order to achieve our company goals. Objectives are defined at monthly goal meetings, in which all team members actively participate. We also use these meetings to decide how we'll celebrate our wins. By recognizing everyone's achievements and contributions, we ensure each team member knows he is valued. We know the secret to work is loving what you do. That's why we ensure there's plenty of fun in our working life. Add in humor and happiness, and you get a place you want to come to everyday. 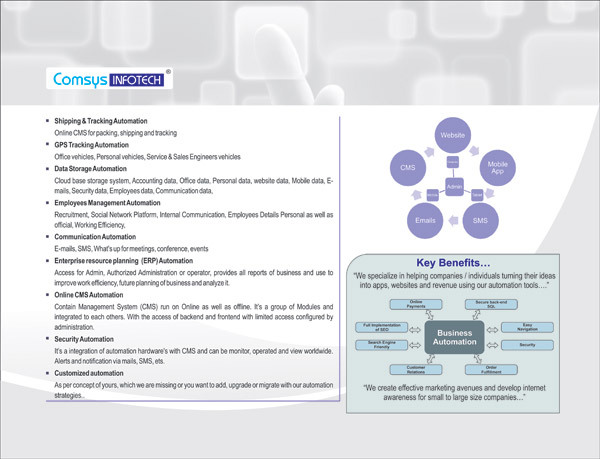 It also adds up to one unique and memorable company personality what makes Comsys Infotech uniquely Comsys Infotech. The words "corporate," "boring" and "stale" are the antithesis of our culture. While we work hard, we play just as hard too. We're more than just co-workers; we consider ourselves a family, and we enjoy spending time together outside of the office. In fact, some of our best ideas were born outside of our office walls. Thanks to our team morale, we have an engaged group of professionals who are working together and enjoying it to shape our company and our industry. Valuing the Input of Everyone Diversity in ideas, opinions and points of view is what moves our company forward. It's what makes us trailblazers. We encourage and celebrate innovative thinking, and we value input from everyone. The input we receive plays a direct role in how our company evolves, from new plans to the processes behind how we function. Before making decisions, leaders seek input from key stakeholders those affected by the proposed changes. Once decisions are made, they are clearly communicated and explained in a timely manner. With open lines of communication, managers know what their team members need and provide them with the resources to do their jobs well. In short, the processes we use to accomplish our goals have been created by the people who understand them best those actually using them. The result? Every team member is invested in our mission and has the tools needed to achieve goals. Fostering Growth We're invested in the success of each other. After all, it's this success that drives our company. More than just "having each others' backs," we actively search for ways to help each other grow. It's also a reason why we primarily promote within. 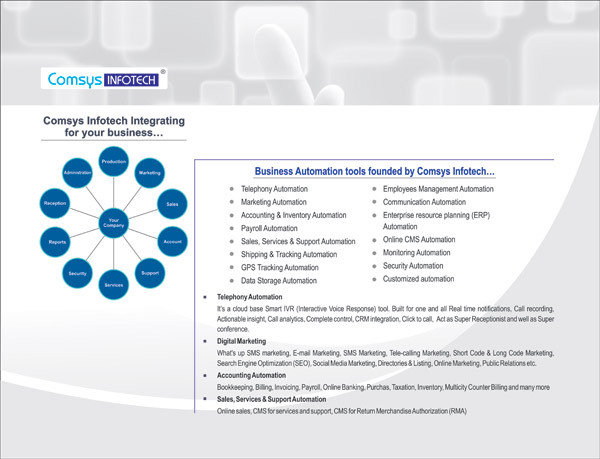 With Comsys Infotech, it's more than just an awesome position with an excellent company it's a career path that promises plenty of growth. It's our belief that everyone has more potential than even he realizes. It's our goal to bring out that potential, and we do this by providing opportunity and useful feedback. When we tap into each member's potential, we're igniting a drive that can't be stopped. Our spirit of growth and support extends beyond our office walls. We regularly host meetups that give us the chance to share our knowledge with our local community. We also stress the importance of giving back. In this spirit of helping others, we run a charity event every year. On an individual level, our team members actively participate in charities, giving them the opportunity to continue doing well for others. More than providing a results-driven service, we also offer essential advice those results in growth for our clients. 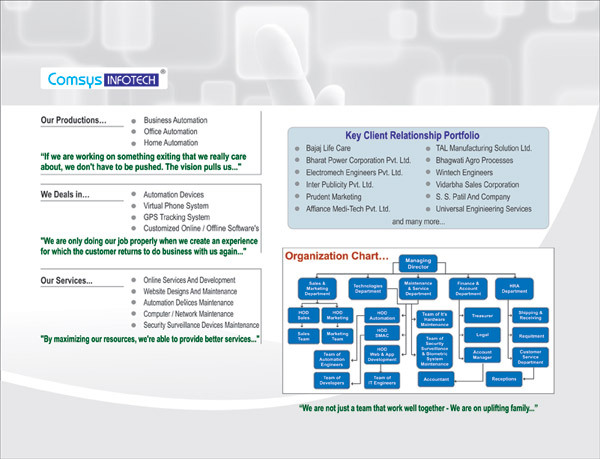 For Comsys Infotech, we view our clients as partners of success. After all, the growth our clients enjoy is a direct reflection of our achievements. In fact, we use the growth of our clients as the benchmark of our own success. The Value of our Clients is Never Underestimated We never underestimate the value of our clients they are, after all, our most important stakeholders. As the lifeblood of our business, we do what it takes to serve our clients well. And we do this by being unconventional, innovative and memorable. In short, we go above and beyond the expected to provide our clients with the innovation they need to experience new heights of success and growth. This is how we function on the day-to-day in everything we do, all the time. Respecting our Clients as Partners To provide a complete, comprehensive service, we seek out client input. While we are experts in our field, our clients are the greatest experts of theirs. That's why we value their ideas and take their feedback seriously. We share these insights with our team to ensure we're providing the best possible service we can. Open Lines of Communication A good partnership requires excellent communication. 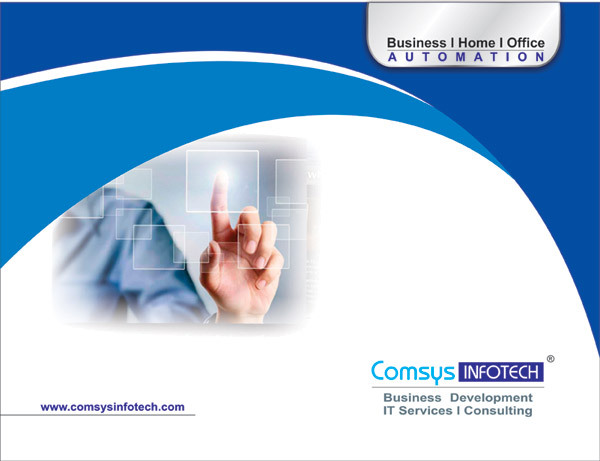 The lines at Comsys Infotech are always open for our clients. Readily available and easy to contact, we can be reached by phone, email and IM. While we can easily be reached, we don't wait to be contacted. By regularly checking in with our clients, we are at the pulse of what is happening. We also use surveys to obtain the feedback we need to support our client's mission well. By maximizing our resources, we're able to provide better services and stretch our clients' marketing budgets. Innovation in How We Work Our team continues to find innovative ways to improve our processes. We take the initiative to streamline our working environment, even when it may not be listed directly in our job description. Why? Because with system-wide changes come lasting and far-reaching improvements. By becoming more efficient, we can ultimately better serve our clients. This means we pay attention to our systems and the procedures and guidelines within them. We're constantly finding ways to improve how we work essential to our quality, speed and efficiency. To us, it's not just about getting the job done; it's about creating the best way to get the job done. It's about using this insight to provide quality products and services time and time again. Measure Twice, Cut Once We also value planning. By taking the time to properly plan, we save time in the end. Identifying and then taking advantage of all the Web offers is second nature to us. So is continual learning. After all, our industry moves at lightning-fast speed. It's our job to stay in front of this learning curve so our clients can enjoy the greatest return from the Web. For us, inspiration comes from anyone and anywhere because our brains are wired that way. For what we do well, we are always on the lookout for ways to do it better. The result is better products and services for our clients. We take advantage of all opportunities, whether it's meeting with the greatest minds in the industry or learning from past performances. We don't believe in mistakes; we believe in learning opportunities, and we evaluate them carefully before moving on. We don't ever underestimate our competition; we use them. By dissecting their growth or failures, we have the knowledge to continue moving in the right direction. This commitment to learning and growth is what shapes our company and moves our entire industry further. It's what propels our clients' growth. 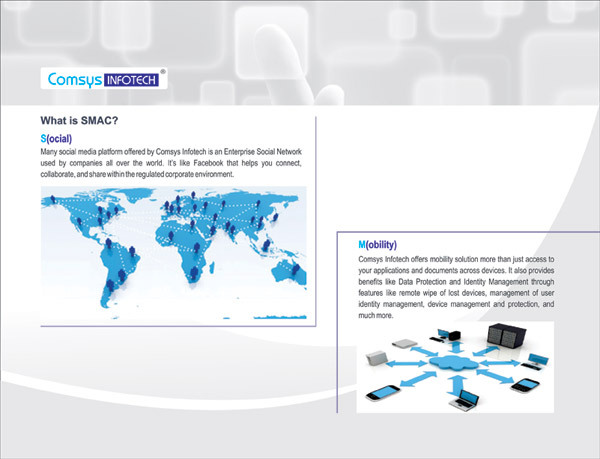 And it's the fingerprint of Comsys Infotech. 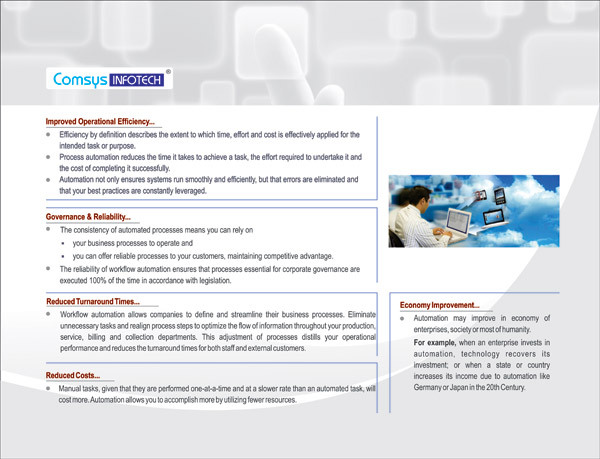 At Comsys Infotech, we value productivity. We set goals, determine how to measure our progress and celebrate results. That keeps us focused on getting the job done and making it happen now. We drive projects forward, with a sense of urgency and a focus on closure. We believe in taking action that results in a real difference. And sometimes that means hustling to make it happen. Taking Action Once we have the knowledge we need, we have the courage to take the action and get it done. While others discuss, we do. For us, there is no point in meetings that don't result in actions. There is no place for strategies that don't get executed. And there is no reason for documents that are full of fluff but no substance. It's this integrity that's behind everything we do. Knowing How to Balance Planning and Action But really, it all comes down to balance … balancing planning with innovating, sense of urgency with perseverance. By keeping our finger on the pulse of our organization and maintaining balance, we do the right things, and we do them well — all while staying on the leading edge of the industry and the technology that drives it. Change is the only constant in our industry. Technology and how society uses it is continually evolving. 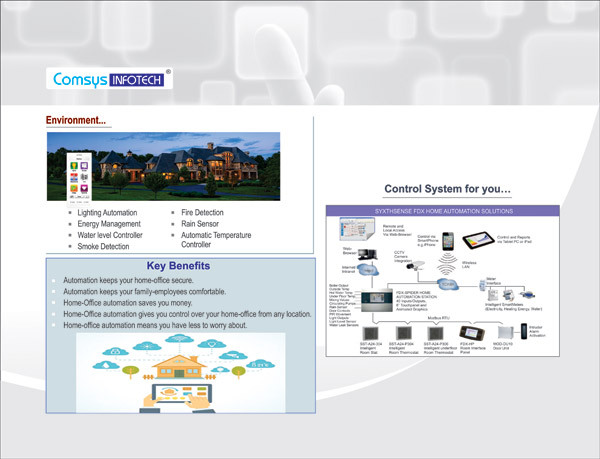 Comsys Infotech is uniquely designed to embrace and harness the power of change. While most companies resist change and many fear it we seek it out. We enjoy the challenge because it means opportunity opportunity to grow both personally and professionally. We know that this growth gives us the ability to continue being experts of what we do. By Changing our Company, our Clients Enjoy Growth Our operational competitiveness breeds change we work hard so we can outperform the next. This daily pursuit adds value to what we offer and it enables all of us our company as a whole, each team member, and every one of our clients to achieve excellence. With an eye on the future, we can offer unique products and services built with forward compatibility. While others don't respond quickly enough to change, we plan for it. Changing the Industry How do you change an industry? By being agile, flexible and proactive by continuously looking for new ways to do it better, faster, stronger and more cost-effectively. While others follow, we lead. 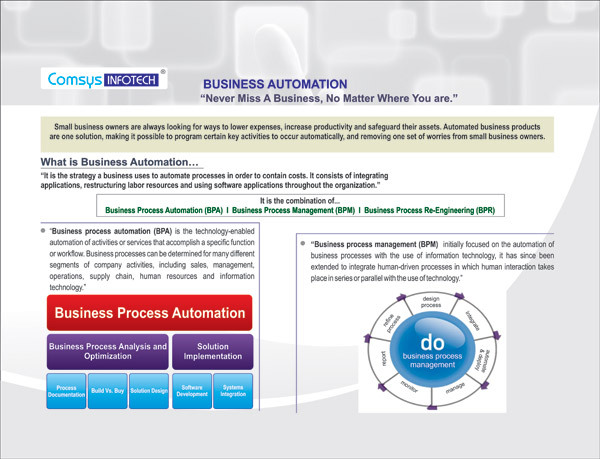 It's how Comsys Infotech is continuing to change the landscape of this industry. This passion to learn and ability to grow can't be replicated by our competitors. But it is celebrated by our clients. As we evolve and the industry moves forward, our clients benefit by more growth and higher revenues. While we are changing our industry, we are also changing how our clients do business. Fearless Determination Drives Us Forward We don't play it safe ... we play it smart. We break boundaries because we have the courage to try, the determination to succeed and the insight to learn. When it comes to taking risks by trying new things, we do it. We work hard, persevering, because we know good things take time. And we learn. We identify the right things, and we do them well. For us, each roadblock we meet during change is a learning opportunity. And from experience, we know learning opportunities strengthen our company. It's an endless cycle for us: we seek out challenge in order to grow and, as we grow, we face new challenges. Any relationship is only as strong as the level of trust it's founded on. And a man is only as good as his word. 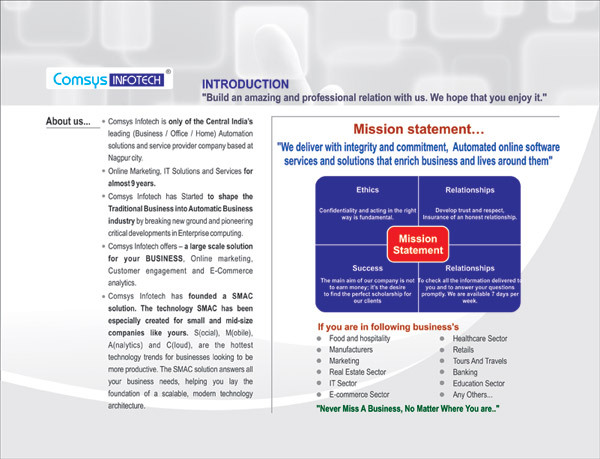 At Comsys Infotech, we're committed to maintaining the integrity and high standards that defines not only how businesses do, but also how we carry ourselves in our personal lives. We do this by keeping our promises and meeting our commitments. We do this by focusing on finding solutions and achieving results not coming up with excuses or placing blame. We do this by being leaders, setting a good example for all. And we do this by taking accountability. For us, being accountable means accepting our actions and their results. It also means being actively engaged in discussions and then supporting decisions once they are made. This accountability is just as important to us when working with clients as it is when we're working together. We are accountable for the ROI our clients trust us to achieve for them, and we take this very seriously. What People Says About our Website loved by millions of customers around the world! Join Us & Give Your Website a Brand New Look! 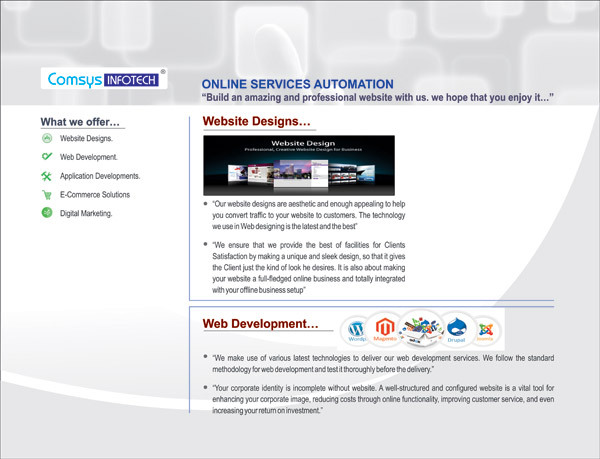 Build an amazing and professional website with Comsys. we hope that you enjoy it.